Abilities: Skilled in weaponry, has superhuman strength and accelerated healing. Arma is the first to awaken to her abilities and soon becomes the defacto leader of the Guardians. The muscular redhead has a tendency to leap before she looks and in the beginning finds herself in a few sticky situations, but her courage and superhuman strength make her a powerful member of the team. 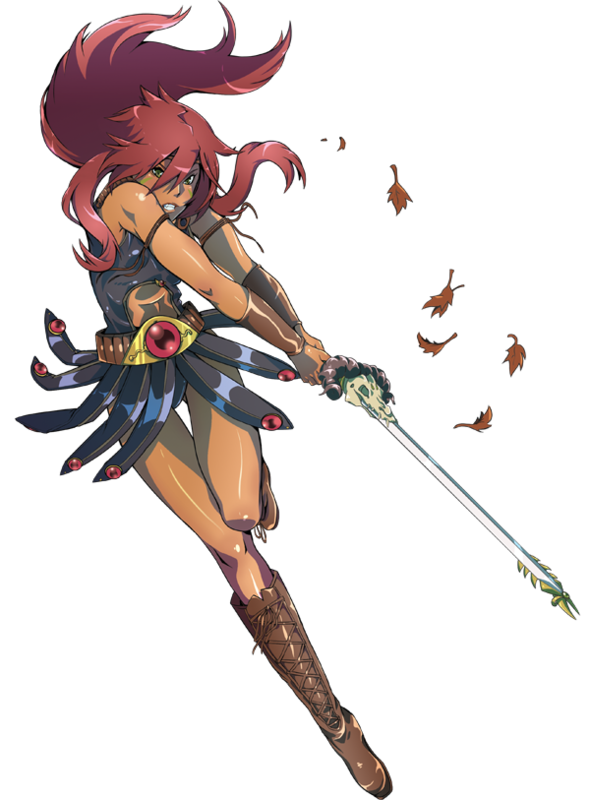 She instinctively wants to protect those weaker than herself and gets along with everyone except Lamia. Like the others, Arma has a case of amnesia that keeps her from remembering anything about her life prior to becoming a Guardian. Her main priority as a Guardian is to protect the little girl she calls "munchkin", who she believes to be an Aeon with answers about her past. As a human girl, Arma is less confident with herself and struggles to accept her more boyish appearance. She attends St. Expeditus Academy as a high school senior, where her peers all assume she is male. She decides to go along with it, since she is admittedly more comfortable in the boy's uniform and because Lamia convinces her this is the perfect civilian disguise. Abilities: Able to project illusions mentally, ??? As the Guardian of Illusion, Lamia is able to cause disorrientation in her enemies (as well as her comrades) through images she projects mentally. She is intelligent and overly confident in both her looks and talents as an illusionist and thinks Arma is unfit to be the leader. While the other girls can usually tolerate her bratty attitude, Arma and even Vox are often at odds with her. Lamia is not very interested in being a Guardian and does not trust Vox, but she is determined to recover her lost memories. Friendly and outgoing, Maris is genuinely excited about the idea of being a "magical girl". A bit of a go-getter who can usually get her best friend Vesta to go along with her ideas, she has a positive outlook on things and generally gets along with everyone in the group. Like Arma, she lets her enthusiasm get the better of her and sometimes jumps into a situation preemptively. Her powers are mainly offensive. In her civilian guise, she works part-time as a waitress at Marty's Diner, which has become a gathering place for many of her teammates. She enjoys shopping, yoga, and socializing with her new friends. 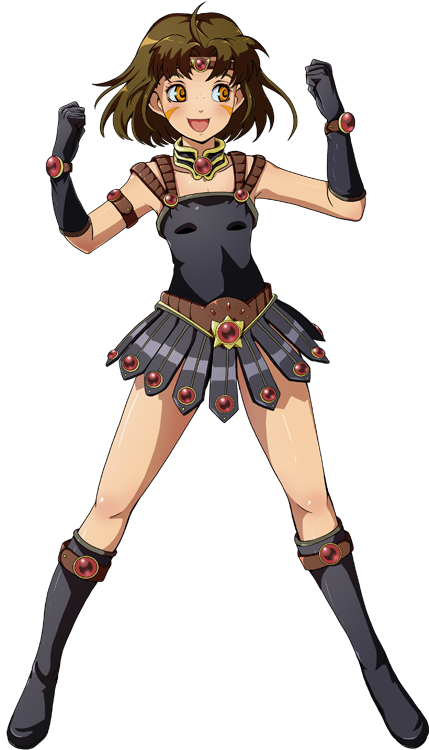 She occasionally will take it upon herself to narrate events as though she were the main character within a magical girl TV series, but is otherwise possibly the most "normal" member of the team. While not the brightest bulb on the tree, Vesta has a big heart and would do anything for her new family. She fights as a Guardian to protect them and can on occasion let her emotions get the better of her abilities. She is particularly protective of Maris, her best friend. Her powers are mainly offensive. Positive-thinking and adores cute things (especially Vox), it is often hard to tell what is going on in Vesta's head as she can frequently be seen spacing out or humming to herself. Despite her childlike innocence, she seems to have picked up the role of "homemaker" with the desire to keep tidy the abandoned schoolhouse the girls reside in. Vesta is not terribly concerned with uncovering her past and wishes to focus more on her new life and family. The oldest in the group, Neiva is cold and seemingly unfeeling and does not often start a conversation with others. When she does speak, she talks in a manner that suggests she is well-read but not overly social. Intelligent and extremely well-endowed, she is disinterested in fighting but secretly wants very much to regain her memories, if only to find a way out of having to be a Guardian. As a Guardian, she is slower and lacks the stamina of her younger peers, but her ice abilities double as offensive and defensive powers. She prefers to hang behind until she's devised a proper strategy for attack, or until she is given an order by Arma or Vox. Ora resisted becoming a Guardian the longest, refusing to fight and insisting there was another way to recover their identities. Ora chose to take the "peaceful" route until she realized Arma and the others were paying for it. She overcame her fears and misgivings and became an offensive Guardian. Ora attends the St. Expeditus Academy as an eigth grader, where she is picked on by her classmates. Though Arma attends the same school, she keeps her troubles to herself because she doesn't want to always rely on and upset Arma. 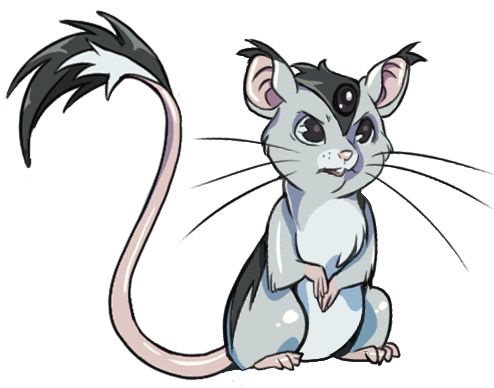 Vox is a talking mouse with a dark jewel in the middle of his forehead who acts as the girls' mentor as they become Guardians. He is the servant of the Aeon known as Terra Maya and watches over her Guardians in her absence. He has the ability to teleport to places with some restrictions and he has the ability to detect monsters raids. He is of an unknown species of mouse, though he insists he is no ordinary rodent. Vox is generally pretty grumpy and often wonders why he's left to babysit a group of rowdy women. Sometimes without warning he will disappear, his whereabouts unknown for days at a time. His favorite meal is expensive cheese and fine wines, and he hates to be treated like the family pet. 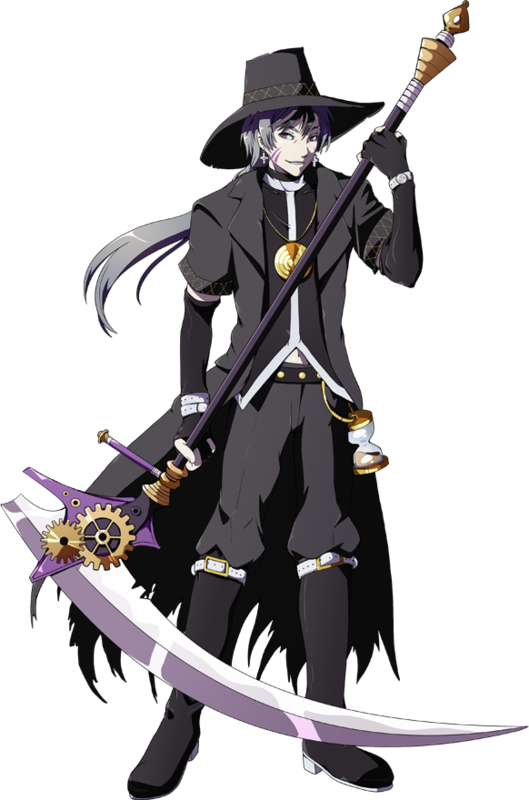 A mysterious newcomer who carries a scythe and dresses in a long, black trenchcoat with a large rimmed hat. He seems to have a penchant for watches and makes Arma and Lamia uncomfortable with his constant spying on the Guardians. His role in the story remains to be seen. During the day, Father Sam works as an assistant priest at the St. Expeditus Cathedral and he's the vice principal of Arma and Ora's school. Arma has come to see him as a friend and confidant, not realizing Sam is moonlighting as the scythe man. He is flirtatious, speaks in a faint accent of unknown European origin, and enjoys ice cream and whiskey equally. Abilities: Can speak to Arma through her dreams. 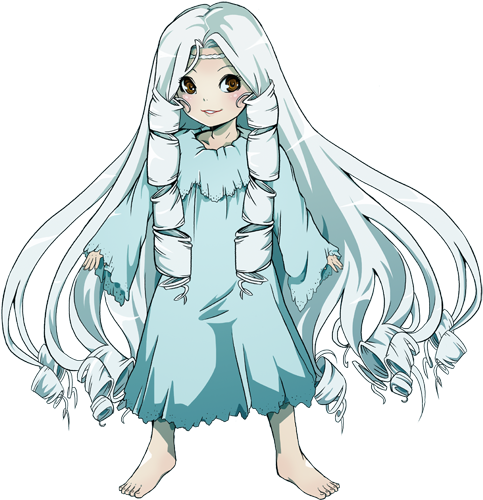 Though very little is known about her, this little girl appears to be about 4 years old but speaks in riddles and hints at knowing more than she lets on. Arma is convinced that this "munchkin" as she calls her is actually the Aeon she is meant to protect and serve, Terra Maya, but the little girl seems to have picked up a similar case of amnesia as she insists she does not know her own name. More than anything, she wants to be Arma's friend and guides her by speaking to her from within her dreams.